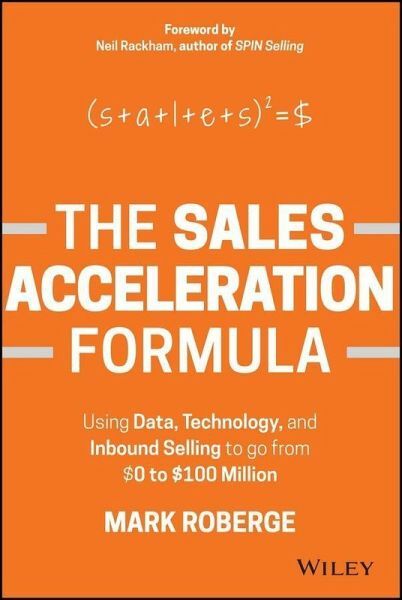 Use data, technology, and inbound selling to build a remarkable team and accelerate sales The Sales Acceleration Formula provides a scalable, predictable approach to growing revenue and building a winning sales team. Everyone wants to build the next $100 million business and author Mark Roberge has actually done it using a unique methodology that he shares with his readers. As an MIT alum with an engineering background, Roberge challenged the conventional methods of scaling sales utilizing the metrics-driven, process-oriented lens through which he was trained to see the world. In this book, he reveals his formulas for success. Readers will learn how to apply data, technology, and inbound selling to every aspect of accelerating sales, including hiring, training, managing, and generating demand. As SVP of Worldwide Sales and Services for software company HubSpot, Mark led hundreds of his employees to the acquisition and retention of the company's first 10,000 customers across more than 60 countries. This book outlines his approach and provides an action plan for others to replicate his success, including the following key elements: * Hire the same successful salesperson every time -- The Sales Hiring Formula * Train every salesperson in the same manner -- The Sales Training Formula * Hold salespeople accountable to the same sales process -- The Sales Management Formula * Provide salespeople with the same quality and quantity of leads every month -- The Demand Generation Formula * Leverage technology to enable better buying for customers and faster selling for salespeople Business owners, sales executives, and investors are all looking to turn their brilliant ideas into the next $100 million revenue business. Often, the biggest challenge they face is the task of scaling sales. They crave a blueprint for success, but fail to find it because sales has traditionally been referred to as an art form, rather than a science. You can't major in sales in college. Many people question whether sales can even be taught. Executives and entrepreneurs are often left feeling helpless and hopeless. The Sales Acceleration Formula completely alters this paradigm. In today's digital world, in which every action is logged and masses of data sit at our fingertips, building a sales team no longer needs to be an art form. There is a process. Sales can be predictable. A formula does exist. MARK ROBERGE served as HubSpot's SVP of Worldwide Sales and Services from 2007 to 2013, scaling the customer base from 1 to over 12,000 and his staff from one to hundreds of employees. Mark holds an MBA from the MIT Sloan School of Management and an engineering degree from Lehigh University. He has been featured in The Wall Street Journal, Forbes Magazine, Inc Magazine, The Boston Globe, and Harvard Business Review. Mark currently serves as the Chief Revenue Officer of the HubSpot Sales Division.